Having the website itself is the most important part of building a new website, right? By itself, a website doesn’t count for much. No one wants a new one just for the sake of having a website. But a site that’s strategically crafted to build your revenue—now that’s an asset worth having. You have goals for your business, and the website is merely a tool to help you reach those goals. Zombo.com is actually a tongue-in-cheek parody of what websites in the 90s were mostly like. As such, it’s a perfect example of a website that exists purely for its own sake. My goal with this blog post is to open your mind to more of the possibilities of what your website can (and SHOULD!) do for your business. After all, it’s the center of your online business activity. So make no mistake, it’s essential to maintaining and growing your business. But your website is not the field of dreams. If you build it, they won’t come. And if they come, they won’t necessarily do what you want them to do. Especially if you don’t really know what you want them to do in the first place. These facts add up to a single truth: you need a strategy to turn your website into a revenue-producing machine. turn those visitors into either leads or customers. All the important stuff happens on your website. That makes it the hub of your internet marketing efforts. But there’s a lot that happens elsewhere that you simply can’t ignore. This isn’t an exhaustive list, but it’s a good representative sample. Before we get to our strategy, we need to take two initial steps so we know what we’re trying to do. What do you want your website to achieve for your business? The main goal of any business is revenue. You might have a bigger philosophical reason for being in business, but no matter what—revenue is essential. So let’s proceed under that assumption. 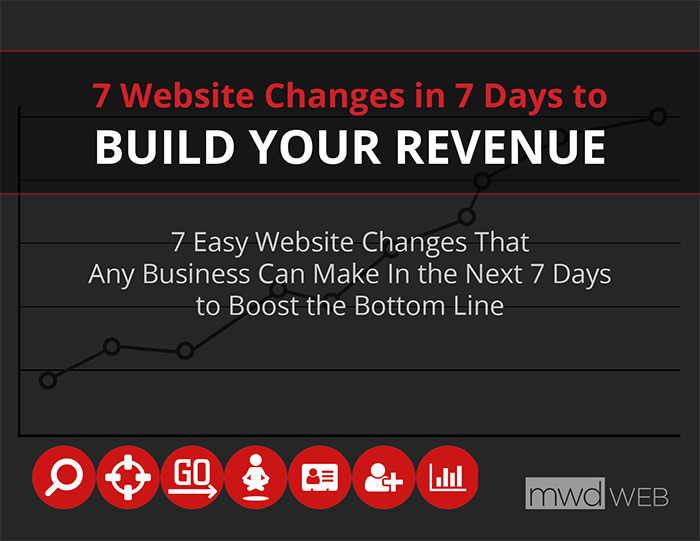 Next you need to figure out how you want your website to build your revenue. Depending on your type of business, this might take various forms. Whatever it is, you need to get very clear on what you want your website to achieve for you. Next you need to know everything you can about your target audience. What pains or problems do they suffer from? This step is so critical, it really can’t be understated. If your website doesn’t connect with your audience, if it doesn’t speak their language and make them feel like you understand them, you’re going to lose them. Are they familiar with relatively recent things like chat widgets? Or are they going to freak out if someone starts talking to them through the browser window? Are they cool with buying something online? Or is that way out of their comfort zone? The more you know about your audience, the better the chance you have of them taking the actions you want them to take on your website. Just like the goal of every business is to drive revenue, the strategy of every website is universal: traffic and conversion. Focus exclusively on the website and ignore traffic and conversion tactics, and your business is in trouble. It’s like trying to drive a car without a steering wheel or brakes. Sure you might eventually get somewhere, but only if you’re really lucky. 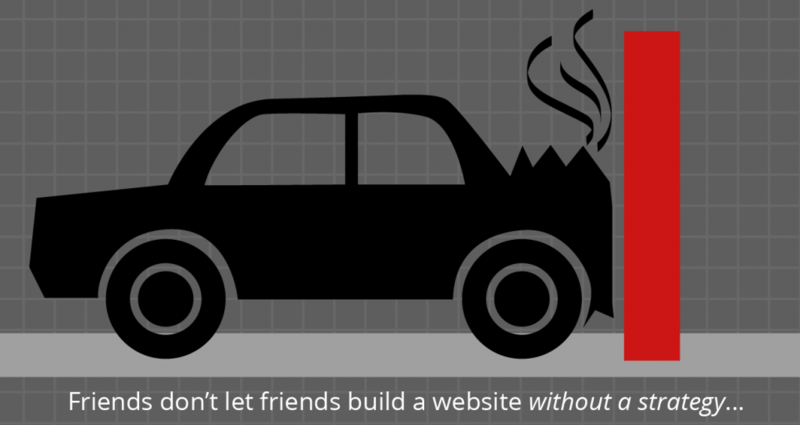 Traffic: Bringing people to look at your website in the first place. Conversion: Persuading your visitors to take some kind of desired action. 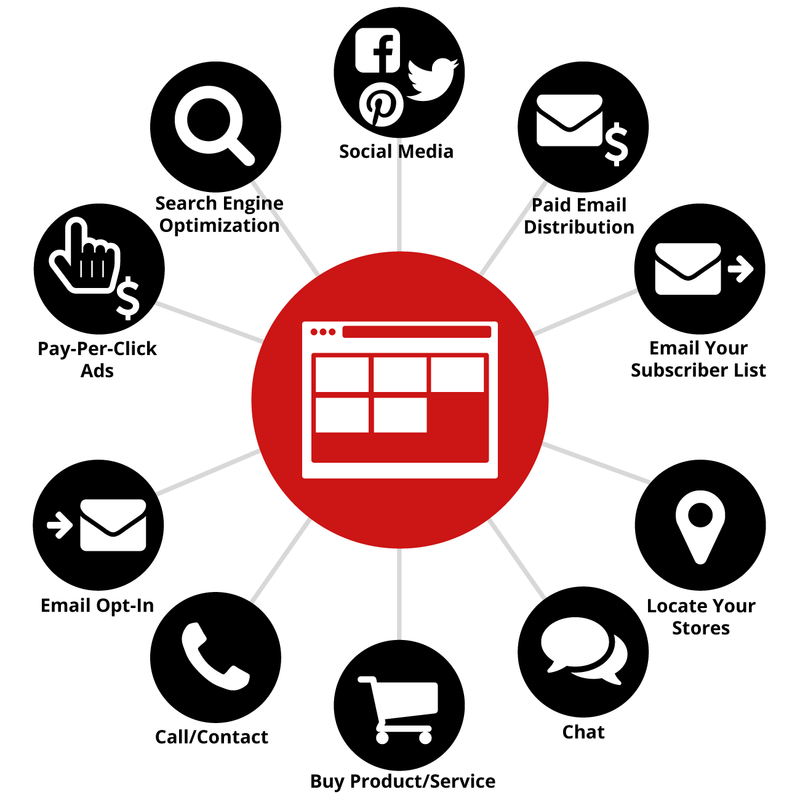 Does your website build your revenue? Traffic covers any lever you might pull to drive eyeballs onto your website. Out of these, search engine optimization and social media posts are fairly passive: you put in the work, and hope that people see you in their search engine results pages and news feeds. And hope that they click on your link. Pay-per-click ads, buying a distribution to someone else’s email list, and emailing to your own list—these are more active tactics. You spend money for new traffic, or you reach out to people who already know you. Either way, you’re actively causing people to come to your website. The kind of traffic tactics you choose will be determined in large part by your answers to the who is your audience question. 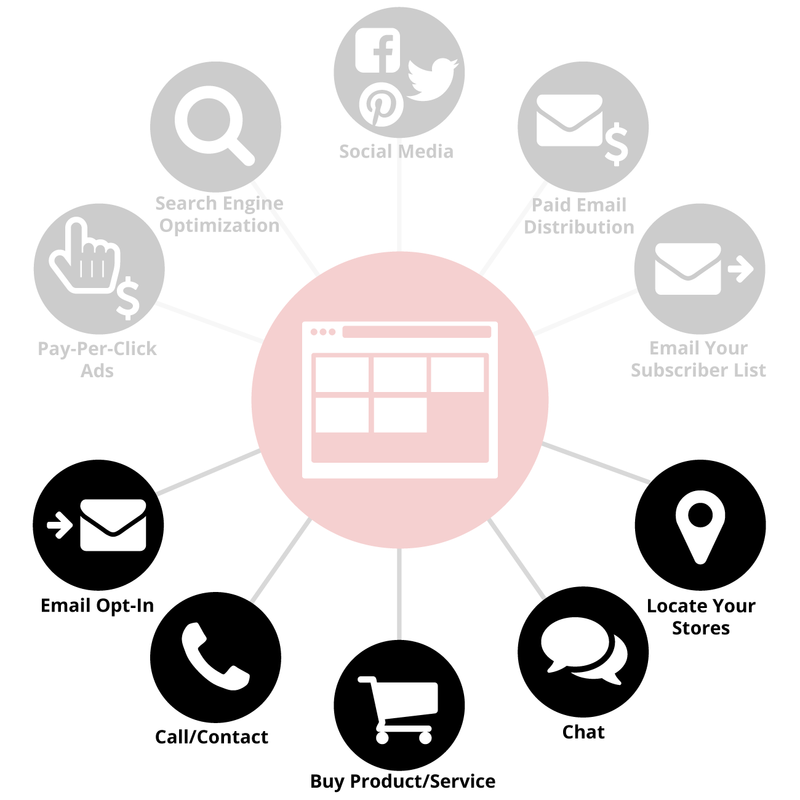 Conversion entails changing the relationship between your company and your website visitors. You want them to go from a casual visitor to a lead or a sale. Out of these, buying a product or service is the one that results in immediate revenue. All the others are a step toward revenue. Opting in to your email list doesn’t make the cash register ring now, but it opens the door to communicating with them, and building that conduit for them to more easily buy your offerings. The same goes for calling or filling out a contact form, engaging with the live chat, and using the store locator. Whatever you answered for the what are your goals question, that will inform your decisions on what you want people to do on your website. All of the above is to say that the website is just the beginning in your online business efforts. It’s one tool out of many to make money for your company. 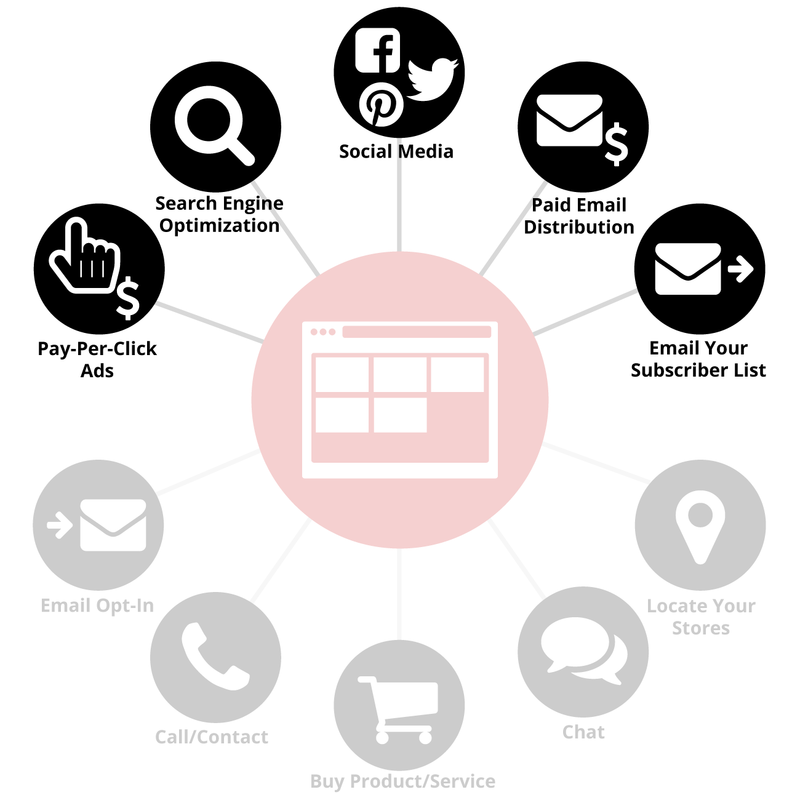 Build your website with your conversion goals in mind. Make it easy for your visitors to take that next step in doing business with you. Then once you’ve built a site for your company, it’s absolutely time to celebrate. But your work isn’t over at this point! Now it’s time to add fuel to the fire and bring in fresh blood to your pipeline. And it’s an ongoing process! If you don’t keep up on your blog, you’ll look like you’re not paying attention (or out of business?). And if you stop paying for new visitors and ignore your search engine rankings, you’re not going to see any new leads come in. If your business wants to take advantage of the colossal, global opportunity that is the world wide web, you’ve got to be on the ball with your marketing efforts. Remember: “If you build it, they will come” is just a Hollywood fantasy. For those of us in the real world, it takes hard work and dedication and, above all, consistency in order to get noticed. But getting noticed is the first step, and arguably the most difficult step, to getting paid. Once you shift the relationship with your visitor, it becomes much easier to make that sale.